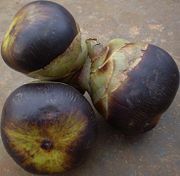 Nungu/Palm fruit is one fruit which you can see only is summer,its one of the best thing to beat the summer heat.It has many medicinal properties.It known as Ice apple in English,its loaded with minerals especially phosphorus and calcium.With absolutely no fat in it, its a boon for those in diet. Have you seen the full palm fruit,here its ,see how it looks. You can eat as like it,take it out remove the outer skin and just eat it. Now coming to the recipe,it such a easy dessert and can be made jiffy.I got this from here made slight changes,try it out and be innovative with it. This is the nungu/palm fruit I had. 1.Boil the milk with the crushed cardamom in it. 2.Cool it well and add sugar. 3.Add the cubed nungu to it. 4.Refrigerate for 30 mins and serve. 1.Blanch the badam/almond and grind it to paste with little milk. 2.Boil milk with saffron strands, and badam paste.allow to cool. 3.Mix sugar to it and chopped nungu fruit to it. 1.You can use condensed milk for richer dessert. 2.Can use ready made badam mix. I have tasted this once, very delicious.. I miss fresh nungu here. Only get canned version. delicious. I have never had this before....looks delightful! Thanks for sharing Babitha!! 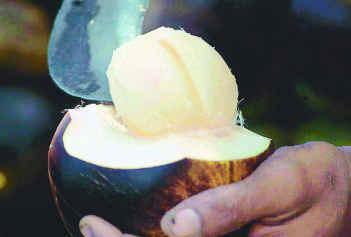 Very very lovely nungu delight, simply superb and a must for hot summer. oh that should be so refreshing and so delicious... Thanks for linking it to my event!! Looking for more yummy recipes! !